If you are new to the blog, you may not know that the whole reason I work to help you save money is so that you have room in your budget to help others who need it. Frequently I post about worthy causes – from adoption to military families. For a long time I was completely ignorant about the fact that it was the church’s job to take care of orphans. I think somewhere along the way I heard it preached that orphans and widows was just a quaint cultural thing during Bible times, but it really meant those who had less than we do. Well, it’s true that we should reach out to anyone in need not just orphans and widows, but someone forgot to tell me that there were real live kids without parents and ladies who couldn’t support themselves after their husbands died. We’ve been blessed to be in a church and even more specifically a small group of believers who are doing life together – and they have completely reshaped the way I see this topic. Several of the families are adopting. Two families are moving to different parts of Africa to work and serve among a generation who has been orphaned by the AIDS pandemic. Unfortunately, the truth is still not reached every corner church. Tony Merida and Rick Morton are doing their best to change that. They have written a book called Orphanology with a forward by David Platt. 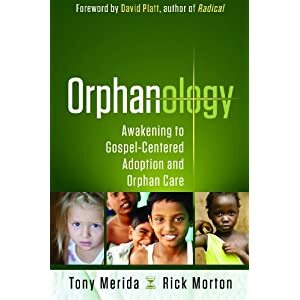 This book intertwines their own personal adoption stories with the biblical basis for adoption and practical ministry advice about how to live and work with orphans in a way that is truly helpful. If you are new to the world of adoption, or, like me, grew up being taught a different view of Scripture that minimized what was referred to as “the social gospel” – I would highly recommend picking up a copy of this book. It will change the way you see the fatherless and the abandoned. It’s on sale right now at Amazon for just $10.19 and is eligible for FREE shipping with any purchase over $25.